Taizhou Qida environmental protection equipment Technology Co., Ltd. is located in Taizhou City, the three coastal industrial city, near the port: Ningbo, Shanghai, the traffic is very convenient.The company is a collection of scientific research, design, manufacturing, sales in one of the professional production of resources recycling complete environmental protection equipment company, main core products: dry miscellaneous line automatic coppermetersmachineand, coppermetersmachineand (wet, scrap wire and cable dismantling production line), electrostatic separation of waste plastics professional equipment, automobile radiator dry dry waste recycling production line, circuit board recycling production line, motor recycling production line, the multifunctional intelligent roller crusher, copper type strong magnetic iron machine, small cable stripping machine, waste refrigerator recycling production line of large production line. 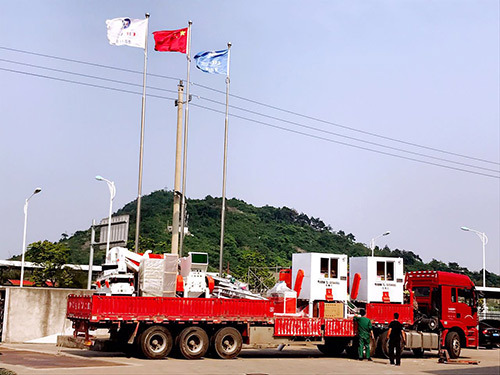 Environmental protection dismantling machinery specialized equipment enterprise, is the domestic and foreign waste dismantling industry leader. Many products have won patent of invention and utility model. The company since its inception, in 15 years of development history, tschida technology environmental protection equipment as a continuously changing innovation of the leading enterprises, with many years of accumulated experience and technical advice to customers, products in the continuous refinement, to create greater profits for customers.My company in line with "people-oriented, technological innovation, quality first, good faith management" concept, gathered a group of high-quality scientific research and management personnel. From the application of advanced technology, the implementation of strict quality management, quality service, customer service, product marketing in Japan, the United States, Germany, South Korea, Singapore, Malaysia, Canada, Thailand, Vietnam, and other more than 20 countries. Favored by domestic and foreign customers and highly valued.The company wholeheartedly welcome new and old customers at home and abroad to negotiate business calls to establish long-term friendly relations of cooperation. 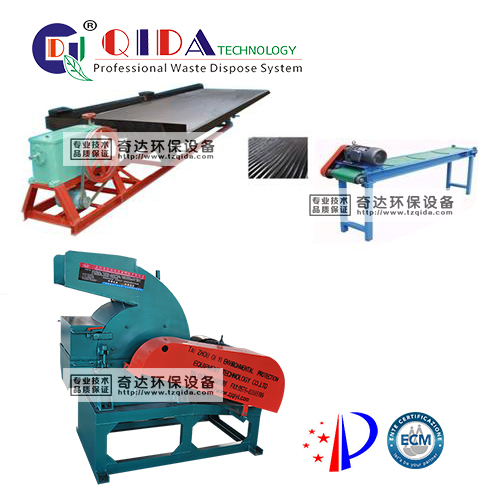 QD-2000A Radiator Recycling MachineRadiator harmless separating and recycling machine，which adopts dry-type crusher ,magnetic separator and air separator to break and separate the radiator， turning the radiator into copper, iron and aluminum. 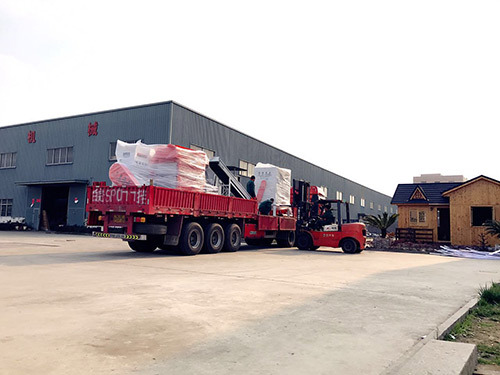 The whole process is conducted in negative pressure.The equipment needs hand feeding and inside hard material, such as chunks of iron or large screws, shafts, should be picked out in advance. Then after first crushing and second crushing, aluminum, iron and copper are taken off. At last, magnetic separator and air separator separate aluminum, iron and copper. Pulse dust catching system is allocated in crushing and separation part, effective solution to the dust discharge. The crushing and separation system is equipped with pulse dust collector system, so the dust problem can be solved. 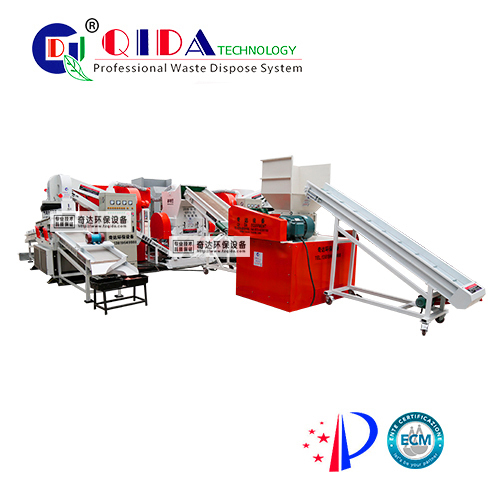 QD-1000 Electrostatic SeparatorIt can be apllied to recycling plastic aluminium composite board, waste printed circuit board, medical blister, waste cable wire, aluminium and sand, etc. QD-600C Dry-type copper recycling production lineFirst, purposeThere are many kinds of waste wires and telecommunication cables used or exchanged in the world. Our purpose is to overcome the loss of copper and other by-products during regeneration and make it more scientific and automatic. It cuts people, improves recovery, and improves production efficiency. 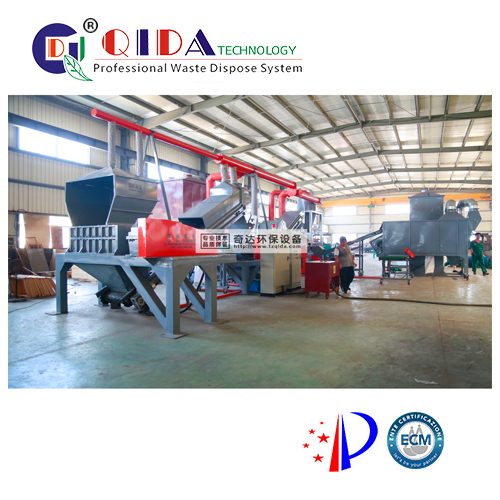 It not only develops the national economy, protects the environment, but also benefits the development of the recycling industry.Two, effectQD-600C type dry copper and rice machine is a professional dry separation of waste wire and cable production line. 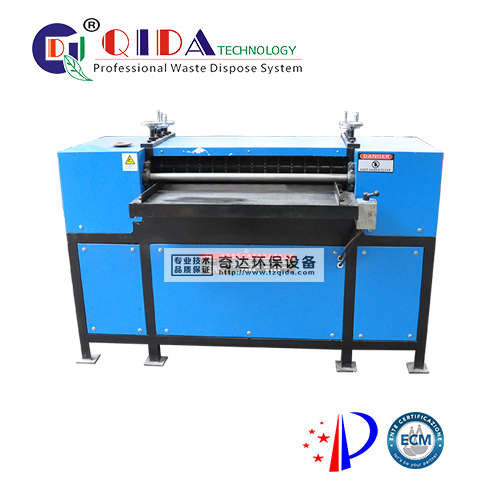 For example: the old car circuit lines, communication cables, and the wire stripping machine is not suitable for processing (various civilian wires) waste miscellaneous materials. Thin filament wires. Characteristics of this machine is the size of the line can be broken without separation and classification, structure of the new, unique, large production capacity, low power consumption. 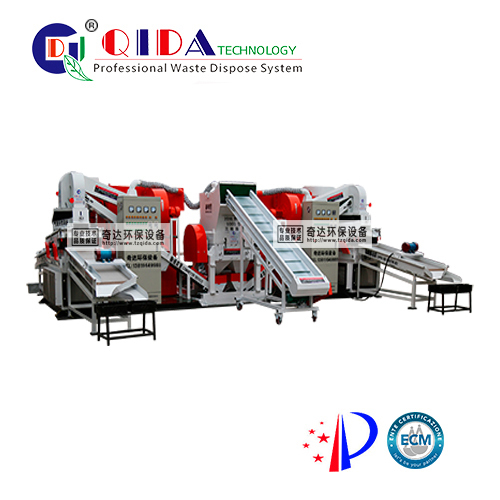 High sorting rate, one feed, multi machine collaboration to complete. 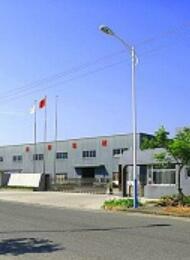 Fully automatic intelligent control is in the leading position in china. 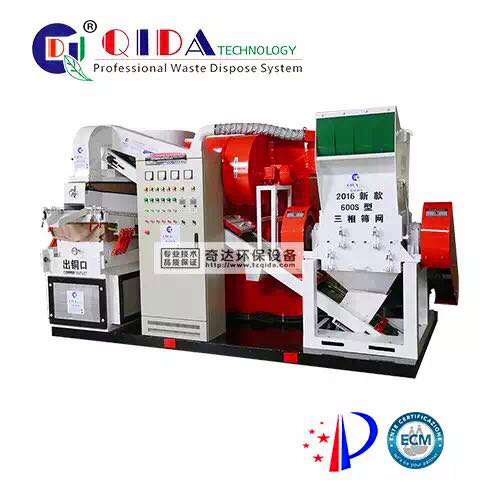 The successful development of the machine solves the problems in the process of burning copper and improves the quality of the recovered copper, and can recycle the plastic and solve the environmental pollution at the same time.1. economic effect: the same wire, the machine has more than 99% recovery rate, can make us in the limited resources in the effective use of more wires, and low price, the user greatly reduce the economic burden.2. 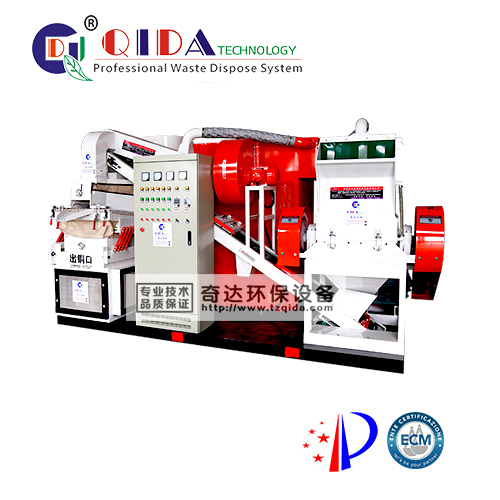 environmental protection effect: the whole process of crushing, sorting and dust collection is rigorous and harmonious, which is more effective than burning or other methods.Three: working principle:Principle: two different density of the material under the action of wind, the screen angle on the amplitude caused by the movement of the wire deflection of high density with a screen oriented copper export forward, small density plastic skin floating out in the above to Pikou copper wire. 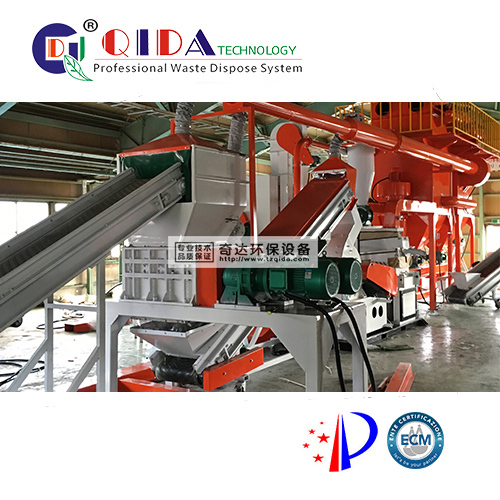 So as to achieve the purpose of separation of copper and plastic.Four, equipment features:After the crushing of waste wire and cable, the automatic mechanical separation can completely separate copper and plastic, and achieve the purpose of comprehensive utilization, and has higher economic benefits. And no dust, no two pollution. In addition, the equipment is an integrated structure, easy to install and debug, and transport (customer purchase after the power supply can be produced), stable performance.1. compact structure, beautiful appearance, reasonable layout, easy installation.2. automatic intelligent control, so that the equipment uniform feeding, intelligent operation, make the operation easier, save worry, save time and effort, to ensure the stable operation of the equipment to the greatest extent.3. crusher adopts roller type, low speed, high torque, large output, small noise, simple operation.4., grinding machine, sorting equipment and dust collection equipment use platform combination, so that the equipment is easy to move and transport, increase the flexibility of the equipment.5. the grinder rotor adopts alternate cutter shaft, which makes the crusher produce higher efficiency, lower noise and more stable operation.6. 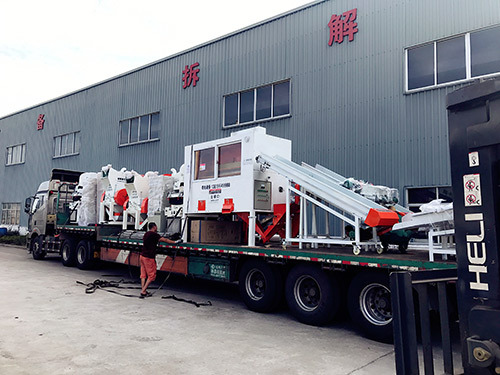 air separation equipment, sorting rate is higher than 99%.The 7. return system makes the semi-finished products undergo two times of crushing, which ensures the complete separation of metal and nonmetal.8. 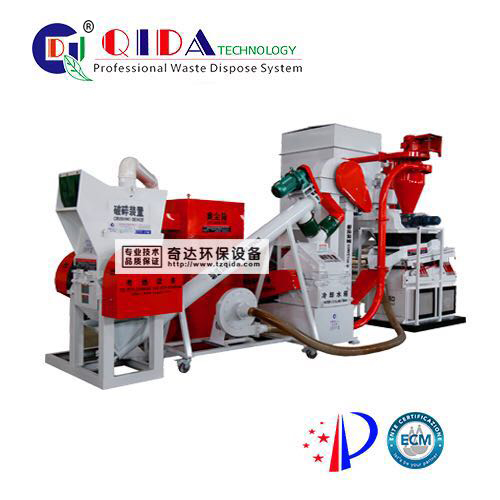 bag dust collection equipment effectively control dust overflow, dust removal efficiency as high as 99%. QD-1500QD-1500 type waste circuit board dry recovery production line is mainly used for the separation of metal and nonmetal in waste circuit boards, copper clad laminate, circuit boards and leftover materials.The production line has novel and unique structure, large production capacity, low power consumption; once feeding, multi machine cooperation to complete; production line is controlled by PLC. The successful development of the machine not only improves the quality of the recovered copper, but also prevents the two pollution. The recovery rate of copper in waste printed circuit board is up to 99% by separating and sorting equipment, and it is still the first in china.In this production line, the waste printed circuit board is recycled and broken by two times to make it a mixture of metal and resin fiber powder, and then the separation process of metal and resin is carried out by wind and electrostatic separation. 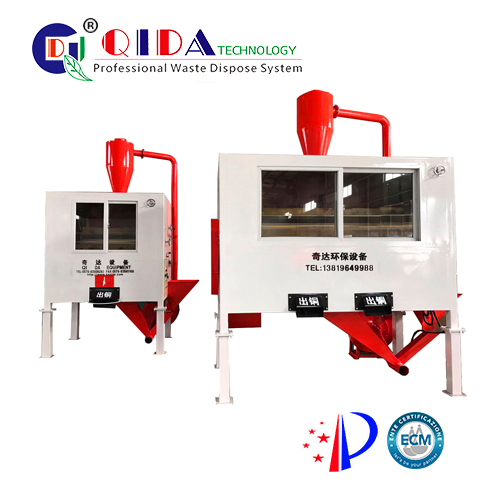 In order to prevent dust pollution during processing, bag dust removal device is added to the air separation process to effectively solve the dust pollution problem. weimingmingQD-500 type dry waste circuit board recycling production line, mainly used for the separation of waste printed circuit board, CCL, circuit boards and other scrap materials of metal and non-metal.The production line has novel and unique structure, large production capacity, low power consumption; once feeding, multi machine cooperation to complete; production line is controlled by PLC.The successful development of the machine not only improves the quality of the recovered copper, but also prevents the two pollution. The recovery rate of copper in waste printed circuit board is up to 99% by separating and sorting equipment, and it is still the first in china.The production line of the waste circuit board recycling processing to take a break, two pieces, the mixture of metal and resin fiber powder; then through the wind and electrostatic separation process route of the separation of metal and resin. 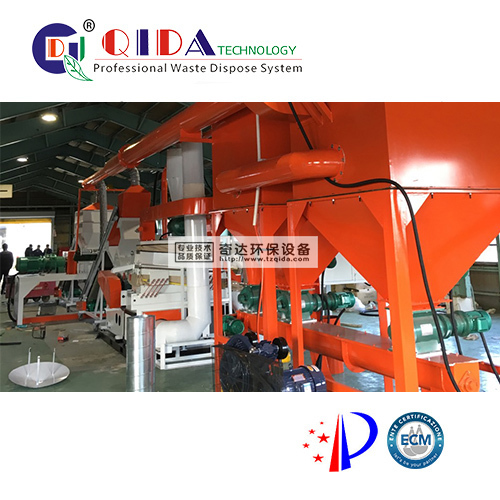 In order to prevent dust pollution during processing, bag dust removal device is added to the air separation process to effectively solve the dust pollution problem.